Scenic beauty, historical sites highlights of visit to Roanoke, Va.
Nestled in the middle of the scenic Blue Ridge Mountains is a town filled with history, culture, shopping and lots of dining options. Roanoke Valley, Virginia, offers wonderful historical and cultural destinations, as well as wonderful dining and shopping. The Roanoke Valley, known as the capital of Blue Ridge Mountains in western Virginia, is located along the Blue Ridge Parkway. Visitors to Roanoke Valley can stay at a historic landmark, The Hotel Roanoke and Conference Center, which has been offering guests luxury, style and hospitality for more than 125 years. Built in 1882, the fully-restored Tudor-style hotel is listed on the National Register of Historic Places. Hotel Roanoke, located at 110 Shenandoah Avenue, is centrally located to the downtown area, as well as historic and cultural sites in the Roanoke Valley. The property is a DoubleTree by Hilton Hotel property. The hotel&apos;s restaurants features locally grown foods from area farmers and businesses. Be sure to try the spoonbread and peanut soup, two signature dishes that are favorites of locals and visitors. For more information on the hotel, call 540-985-5900 or check out the website at www.hotelroanoke.com. A short walk from the hotel is the Virginia Museum of Transportation, the Taubman Museum of Art and the O. Winston Link Museum. The walk to the Virginia Museum of Transportation showcases historic markers and artifacts from the railroad industry. Inside the museum, visitors can explore historic locomotives and other rail equipment, as well as cars, trolleys, buses and buses. The Taubman Museum of Art features American art, folk art, modern and contemporary art with both regional and national exhibitors. Tours, special events, classes and camps are offered year-round. O. Winston Link&apos;s photography is featured in a museum at the visitor&apos;s center. His stunning work features the heritage of the last major steam railroad, the Norfolk and Western Railway. For a look of his life and the history of the railway, check out the movie offered several times daily. The most visible attraction in the downtown area is the Roanoke Star, a 100-foot high illuminated steel and concrete structure that is a beacon at the top of Mill Mountain. It has been in place for more than 60 years and is a popular stop for visitors to the area. The view from atop the mountain of the Roanoke Valley is amazing. It&apos;s also a great place for some hiking and outdoor adventure. While in the area, check out the Mill Mountain Zoo, which has 88 species of animals, as well as a train ride for the youngsters. Prairie dogs, goats, pot bellied pigs, wolverines, snow leopards, red pandas and pallas cats are among the animals found at the zoo. The Roanoker Restaurant, located at 2522 Colonial Avenue, has been serving the area since 1941 and has recently received national attention, including the biscuits being featured on the "Today Show" and in "Southern Living." The biscuits were great with an order of wafer-sliced country ham with red eye gravy, served with two eggs and grits. Also be sure to try the sausage gravy. It&apos;s a Southern breakfast that is a delightful way to start a day of exploring Roanoke. In downtown, the Market District is a great place to find fresh produce and flowers, unique gifts and fun dining. A farmer&apos;s market is the central point of the shopping district. Grandin Village offers charming shops filled with unique gifts and treasures. In Too Many Books, located at 1330 Grandin Road, you will find a treasure trove of books. From classics to mysteries to romances, you will find it all in this wonderful book store. Plan to spend some time exploring every corner of the book store. New to Me Consignment Boutique is a great place to find a treasure, including vintage purses, artwork and antiques. Black Dog Salvage is a unique place filled with all kinds of antiques and architectural relics. You can spend hours looking through all of the treasures in the 40,000 square feet site. Antique wrought iron, stained glass, mantles, garden structures, doors, vintages house parts and more are among the items to be found. The General Grandin Theatre, built in 1931, continues to offer first-run and classic movies. It is a historic site, as it was the first theater in Roanoke to offer "talkie" movies. Free cartoons are offered on Saturday mornings. While in Grandin, stop in Cups for coffee or tea and a pastry or lunch. Local art and information on the area from owner Michelle Bennett are other reasons to stop in. With the comfy chairs and sofas, it&apos;s a great place to hang out. In the nearby Southwest Historic District, Wildflour market and bakery at 1212 4th Street Southeast is a great stop for lunch. The first thing you will notice is the amazing array of cakes located in the glass cases alongside one wall of the restaurant. The menu includes soups, salads, sandwiches, wraps, entrees and desserts. A great choice is the doctor&apos;s macaroni and cheese, which has mushrooms, onions, garlic and cheddar cheese sauce with bread crumbs on top. Each December, the Historic District of Old Southwest offers a Holiday Tour of Homes. Eight to 10 properties are showcases each year. It&apos;s a great look at some of the historic properties in the neighborhood. Located a short drive from Roanoke Valley, is The Natural Bridge in Virginia&apos;s Shenandoah Valley. The natural wonder was deeded to Thomas Jefferson. Jefferson established a visitor lodge and opened the site to visitors from around the world. The site remains privately owned and opened to tourists. Admission to the Natural Bridge includes a visit to a Native American Monocan Village, the Natural Bridge Caverns, a wax museum and toy museum and a drama of creation light show each evening at dusk. A hotel is located on the site. In nearby Salem, you can check out a minor league game featuring the Salem Red Sox. The stadium is a perfect size with great seats on all levels. Grab a hot dog and sit back to enjoy a fun family night out. For more information, go to www.salemsox.com. 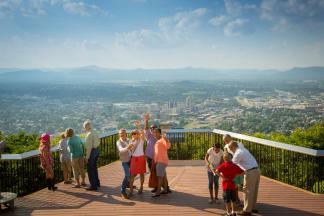 For more information on Roanoke Valley, go to www.visitroanokeva.com.